The River Test is one of our most famous, if not the most famous, trout river in the country; yet we have significant evidence that it is sadly in decline. Furthermore, we can now point the finger firmly in the direction of Chilbolton and Fullerton Waste Water Sewage Works; or, more aptly, the permits which legally condone their destructive discharge. How do we know the River Test is in trouble? Unfortunately, our River Test Riverfly Census (full report due in September) records a significant decline in riverfly and gammarus numbers between 2015 to 2017, at the Mayfly Inn. 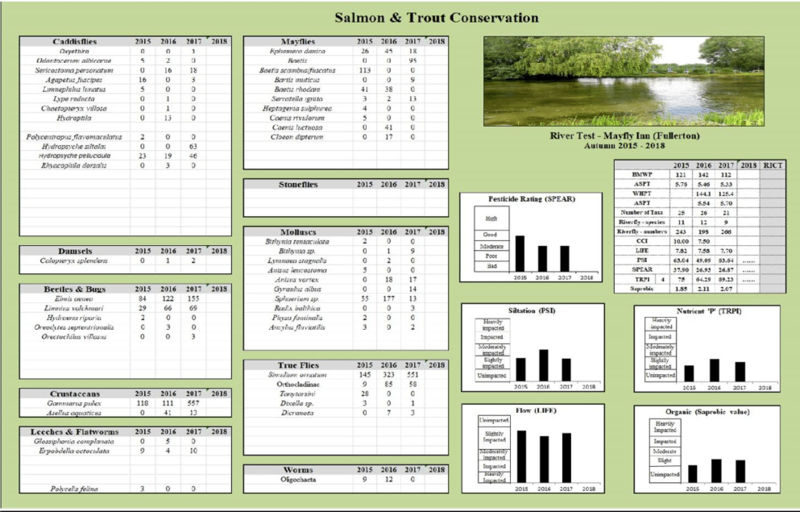 Moreover, the data provides important evidence of the pressures facing flylife on the River Test, helping us understand what is happening and what can be done to improve the water environment and its wildlife. Sadly, the decline in flylife on the middle reaches of the River Test is not news. Dr Cyril Bennett and Warren Gilchrist have charted the decline in the Blue-Winged Olive population at Leckford - just downstream of our Census sample site at the Mayfly Inn – since 1995. This decline in flylife matters not only for fish and other river creatures – invertebrates are the base of the aquatic food chain - but also for anglers, and anyone else who respects this iconic river and the creatures that reside there. Why is this decline happening? Dr Cyril Bennett has now produced a report which, together with our Mayfly Inn results, throws more light on the causes of the problem. This data show us that elevated levels of phosphate and sediment are the overwhelmingly likely cause of the problem. (Phosphate and sediment, when present in such excess, cause a choking of the river and are essentially destructive to life). This is supported by the Environment Agency’s own in-river phosphate data. Their data shows that phosphate levels in the Test (at the Mayfly Inn) are consistently at least double than what is expected for a chalk-stream. This has been an increasing ominous trend since 2012. Why is there so much sediment and phosphate? Two Waste Water Treatment Works (WWTW) discharge into the Test directly above the Mayfly Inn sampling site: Chilbolton and Fullerton. Chilbolton slashed its discharges in 2007 after an upgrade. Fullerton, a much bigger operation, is reporting a steady increase in its phosphate discharge levels. Our suspicion is that the Fullerton works is under increasing pressure from the growth of Andover. Both these works have phosphate stripping technology and appear to be within their current consent levels. The problem, indicated by our results, is that these consent levels are far too high for the river’s ecology. This is a depressingly familiar national story. The WWTWs are not the only source of phosphate and sediment – septic tanks and agriculture play a role – but they are one main source of the problem. Based on S&TC's independent research and the work of Dr Cyril Bennett, the Environment Agency is now working with Southern Water to reduce its discharge of phosphate. The long-term target for the river is 30 micrograms/litre with an interim (2021) target of 40 micrograms/litre. The problem is that Southern Water (and all other water companies) are given far too long (6 years under current regulation) to make these necessary changes. We continue to lobby to get the companies to up their game sooner rather than later. Perhaps Mr Gove, or whoever will be the Environment Secretary after the summer holidays, will shorten the investment cycle. Fullerton was clearly performing much better in the recent past, so why cannot Southern Water act now? 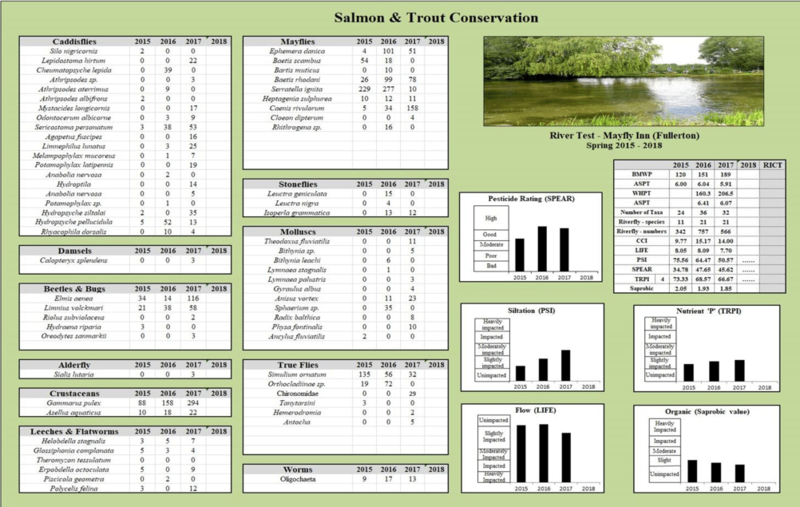 Full results from our survey for the River Test (supported in 2017/2018 by the Test & Itchen Association) will be released in September - please check our Riverfly Census page for more info. We receive no government funding for our important research, which, critically, allows us to pressure the EA with complete impartiality. If you want to help us protect chalk-streams both locally and nationally, and contribute to the ongoing fight to preserve our precious freshwater ecosystems, then please consider joining us as member or making a donation.